I've been feeling a bit disappointed that I haven't been writing more, but I've realized two things: I've been traveling a good deal (Honduras trip pics coming soon! As soon as we get a new computer.). And, all I want to do whenever I have a spare minute is cook. So I've decided to start documenting my adventures in cooking as a way to combine my interests and keep up my blog. As I wrote earlier, I've developed a curiosity about ecofriendly cooking (local food, reduced packaging, less meat, sustainable cooking tools), healthy eating (organic whole foods, superfoods, less meat), and thriftiness--what I'm thinking of as "depression-era cooking"--using inexpensive ingredients like sweet potatoes and dried beans, using minimal packaged foods, and cooking nearly every meal. This combination has stimulated my creativity, sent me diving into new recipes and old-timey guides, and assuaged some if my worries and discomforts. For example, I know that nonstick pans are supposed to be dangerous, if they crack and the coating starts breaking off. Ours has, but I've been hesitant to buy yet another pan and send yet another item to the landfill. And then I was reading this memoir, Little Heathens, about growing up on an Iowan farm in the Great Depression. They cooked almost everything in cast iron pans. We've had a cast iron skillet for years, but hadn't cared for it very well and it needed seasoning. So this past week, I seasoned it multiple times, with drippings from some amazing bacon I bought in Grand Central Market, at the new meats stand run by Murray's Cheeses. And it worked so well that i tried it on a "pretreated" Le Creuset skillet that has always been too sticky--so much so that I stopped using it, and always had little flashes of resentment whenever I saw the pan, feeling that it had been a big waste of money. No longer! Now both of the skillets work great! I know it's nothing like forging a living on a family farm in the great Depression, but there's something satisfying about refurbishing and reusing, and opting out of the "buy new", disposable way of life we've become accustomed to, even if only in a small way. In upcoming posts, I'll describe how to make batches of breakfast burritos in advance (yummy, convenient and cheap! ), how to make sure you don't waste that leftover fresh cilantro, and what to do to salvage mealy winter tomatoes. 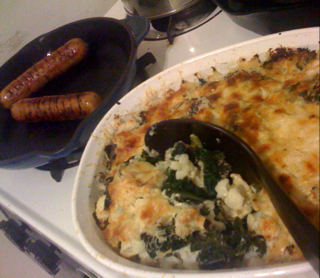 Pictured: cauliflower and kale gratin, seasoned with brown mustard vinaigrette, and organic chicken and spinach sausage. Delicious!